here, it just rose. You still don’t see it? I asked my buddy in exasperation as the 18-inch trout took a mayfly for the fourth time in 10 minutes. Then it hit me. “Here,” I said, shucking my sunglasses, “try these.” We’ve all been there; that moment when we introduce a new angler to the sport, and we’re suddenly reminded of how important our polarized sunglasses have become to us. Polarized sunglasses use a film fused to the lens to block light hitting the eyes at certain angles. According to experts across the optics industry, this film typically includes “poly-vinyl alcohol molecular chains” aligned like Venetian blinds into horizontal slits. We’re all familiar with the end result: Glare from flat surfaces, especially the water’s surface, is eliminated or reduced. Unsurprisingly, according to Smith Optics’ fishing general manager Peter Crow, only the best (and also the most expensive) shades get built with high end, camera-filter-quality polarizing film. Polarized films can be applied to any color of lens- the only caveat is there must be some light blocking to achieve the effect. “Clear polarized lenses are impossible,” Crow explains, “because no light would be filtered.” But where do we go from there? Why are there so many colors of lens? Is glass better at polarization than plastic? If we could only afford one set of $200 shades, where should we invest that kind of dough? We posed these questions to experts from the sunglasses industry, and they shed some light on the art of Photoshopping the world literally right before our eyes. 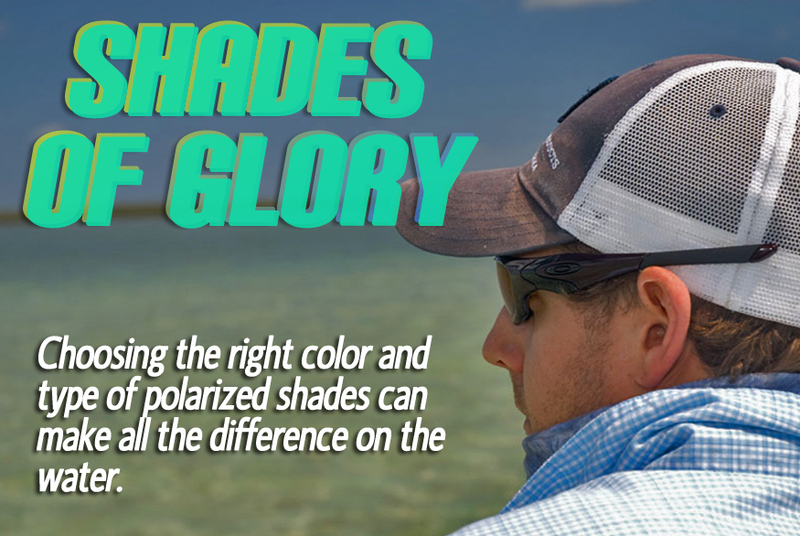 Ed Moody, VP of product development for Costa sunglasses, explains the basics: “The truth is the color of lens best suited for fishing changes throughout the day, and that’s why we make so many different colors. If you make your living on the water-if you are a pro-you need to have a range of colors available.” Non-pros, of course, can get by with only one set of shades. But which ones? Some people, Moody explains, prefer the neutral effects of the plain gray lens. which “doesn’t affect how the eye perceives color at all.” Instead, your gray lens will simply dim the world (and also protect your eyes from flying hooks). “A colored lens can help accentuate contrast in a way neutral gray does not.” The experts agree that a theoretical “cycle” for a day on the water (for someone with an unlimited number of sunglass choices, naturally) would look something like this: At sunrise and sunset, the best lens is a “sunrise” or yellow-based lens meant to block yellow light. As the sun rises higher in the early morning and early afternoon hours, a copper- or bronze-based lens becomes most effective for fishing purposes. At high noon, green and blue lenses (or a simple gray lens) fit the bill. In a nutshell, increasing ‘contrast’ involves enhancing one part of the visible light spectrum, almost always at the expense of another. Taking the example of a bronze lens, Saylor continues, “It is designed to transmit less blue and green light, but far more yellow, orange, and red light. The benefit obviously being enhanced contrast and the ability to see those objects with more yellow, orange and red color in them. The downside is the lack of contrast when you are looking at blue objects, particularly the sky, which gets washed out.” The end result is literally like Photoshop: by eliminating “noise” from the picture, good shades can increase contrast (thus making fish more visible) and also help display contour and nuance on a river bottom or saltwater flat. Brown-based lens colors such as copper, amber, and bronze do the best job of eliminating the most blue light. That makes them most effective during the broadest time range. The exceptions are the early sunlight hours, when copper and amber lenses typically block too much light to see properly, and at high noon, when they do not block enough. That doesn’t mean one can’t make a bronze lens for low light conditions, Oakley’s Ryan Saylor explains, it’s just that manufacturers vary the “intensity” of the light filter according to how they think a given color is most likely to be used. That means not all lenses are created equal when it comes to “visible light transmission,” which is an optics-industry term usually abbreviated as VLT. Polarization makes fish visible, but color choice allows them to stand out against the bottom. 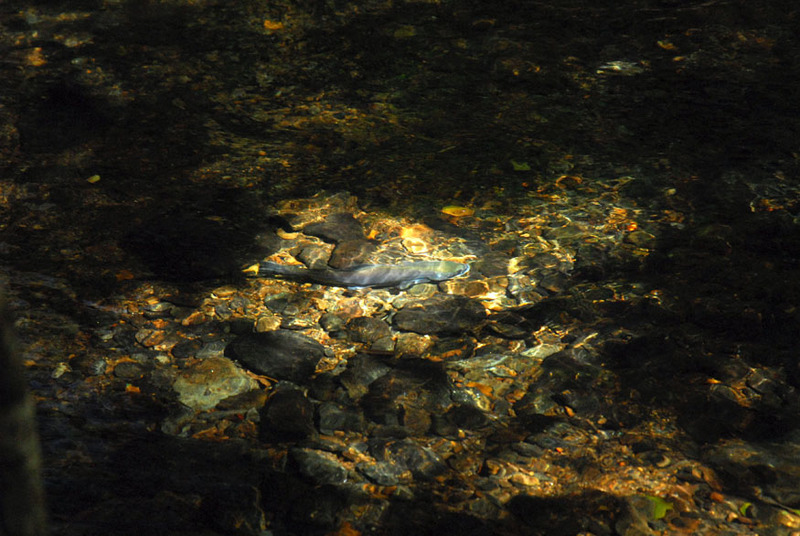 Here, amber lenses highlight the trout against the tan and gray rocks. Yellow-based lenses are almost always intended for use in low light conditions, and thus they are built to allow the greatest amount of light through. “Our photochromic yellow lenses have a VLT from 15 to 30 percent,” says Smith’s Peter Crow, meaning that 70 to 85 percent of the light hitting the lens is blocked (actually a relatively high figure for yellow lenses). However, the human eye perceives yellow as “bright” regardless of how much light is actually being filter.” “If you put those yellow lenses on at midday,” notes Crow, “they’ll knock your head back.” Contrast that figure with a dark gray or blue/green lens meant for use at midday, which sometimes will have a VLT in the single digits (meaning more than 90 percent of all visible light is blocked). The experts agree that if you are limited to one lens for fishing, your best bang for the buck is going to be a copper or bronze tint. “Copper is easy on the eyes-the old ‘rose-colored glasses’ analogy comes to mind,” says Peter Crow. “Copper also increases contrast in a wide range of light conditions,” according to Ed Moody. Oakley’s Ryan Saylor said, “I would always use a bronze-based lens for fishing even if I varied the intensity.” (Color names also vary somewhat from manufacturer to manufacturer, so be sure to try on different brands of lenses if you’re trying to match a specific color profile). However, all the experts we talked to also advised having a second, low-light lens available, for one simple reason: eye protection. “Fishermen like to fish at dawn and dusk, when an all-purpose lens isn’t the best,” notes Peter Crow, “but those hooks are still flying around.” Thus even for a non-pro, some form of low-light lens is advisable (even if all you can spring for is a pair of clear weed-eating glasses). Another thing to keep in mind is that the outside color of a lens may differ from the inside color. Costa’s 580 Silver Mirrors, for example, are actually a copper-to-rose lens as perceived by the wearer. Similarly, Smith Optics’ Blue Mirror lens actually has a brown tint. The best way to make sure you’re getting what you need is to try on multiple pairs with someone present who understands the real nature of each lens, for instance at a fly shop. 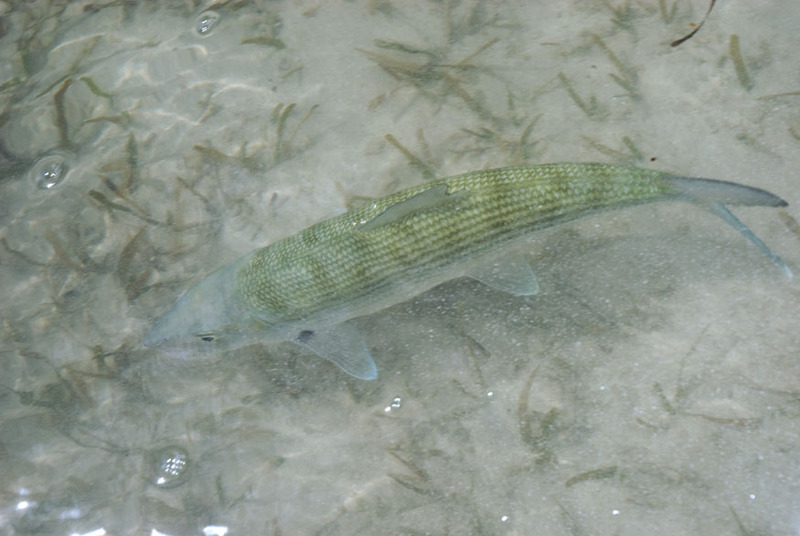 Bonefish rely on their camouflage to stay invisible. Copper, amber or bronze lenses will reveal them. Once you’ve picked out a lens color, whether low-light yellow, all-purpose copper, or midday gray, you’ve still got some decisions to make. Frame style is a fashion choice (although tighter fitting lenses will block the most side light). But what about plastic versus glass? Costa’s Ed Moody says this is more of a matter of durability versus weight rather ‘than a performance question. “Some people really perceive the weight of sunglasses on their face, while others don’t notice,” he explains. “And then there are the people who toss their glasses in a purse or tackle bag, versus those who religiously wrap their shades in a protective cloth and put it away in a case.” If weight bothers you, go with plastic lenses. (Treat them carefully, however! Plastic is more prone to scratching). If you’re hard on lenses, glass is a better option. You can wipe it with a shirtsleeve and it won’t scratch. From a visual performance standpoint, in high-end lenses at least, the differences between glass and plastic are minimal. Whichever lens you choose, always wear some form of eye protection, even if all you can afford is a pair of $10 gas station polaroids. At the end of the day, our eyes are the most important fishing tools we have. This article originally ran in the November/December 2013 issue of American Angler magazine. 2 Responses to "Shades of Glory"
I don’t know if you remember my family but our fathers are old Rogers buddies! I also grew up with the Campbell’s and remember your family through them. Love you blog, and this entry in particular. I am an optometrist and own a clinic in Fayetteville, AR. We pride ourselves on tailoring vision to the needs of the individual and, more specifically, those who live outdoors. Love your blog and would love to help if you every need in info regarding optics or vision!! Hope all is well Zach! Happy fishing!